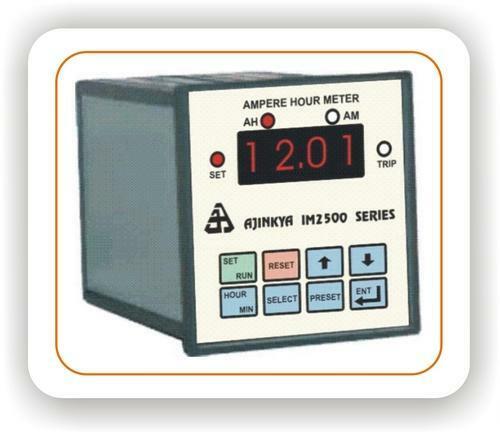 Our range of IM 2501 ampere meter is provided with a set point to control the rectifier. When a certain amount of charge is passed through the bath, meter operates a relay. Further, this relay can be used to directly cut off the rectifier or alternately to alert the user about completion of the job. IM2501 is one of the most common models meant for measurement of charge through electroplating bath. This model receives direct input from an external shunt and calculates the charge through circuit immediately. Based in Mumbai,We are a professionally managed organization putting meticulous efforts to promote Indian engineering industry at global level by offering technically superior control equipment such as Electronic Digital Counter, Electronic Digital Timer, Process Control & Automation Products, Test & Measurement Products, Production Monitoring Products, Consumer Electronic Products, Display Systems and Custom built products. Understanding the fact, that standard products are unable to address all the requirement of our clients, we efficiently tailor-made our range as per the technical specifications provided by them. Further our in house manufacturing unit enables us to provide our clients with quality range & bulk deliveries, which have made us, stand in the domestic as well as international markets. We export our range to various countries like Thailand, Netherland, UK, USA and Saudi Arabia.